1. If you consider it a sport to gather your food by drilling through 18 inches of ice and sitting there all day hoping that the food will swim by, you might live in Michigan . 3. If your local Dairy Queen is closed from November through March, you might live in Michigan . 4. If you instinctively walk like a penguin for five months out of the year, you might live in Michigan . 6. If your dad's suntan stops at a line curving around the middle of his forehead, you might live in Michigan . 7. If you have worn shorts and a coat at the same time, you might live in Michigan . 8. 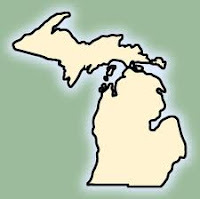 If your town has an equal number of bars and churches, you might live in Michigan . Part 2 - You know you're a true MICHIGANDER when . . .
15. Down South to you means Ohio . 28. You know it's possible to live in a thumb. 30. You actually understand these jokes, and you forward them to all your Michigan friends . . . .